Adult Sinusitis GUIDELINES Pocket Guide is based on the latest guidelines of the American Academy of Otolaryngology – Head and Neck Surgery and was developed with their collaboration. 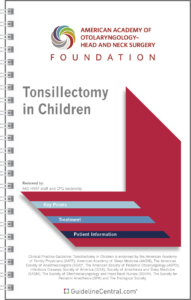 This practical quick-reference tool contains key points; detailed evaluation recommendations; extensive and drug tables including specific indications, contraindications, approved ages, dosing, side effects and OTC vs. Rx; evidence-graded key action statements (guidelines); and environmental control measures. Sinusitis affects about 1 in 8 adults in the United States, resulting in over 30 million annual diagnoses. 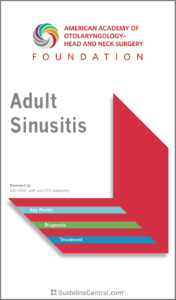 More than 1 in 5 antibiotics prescribed in adults are for sinusitis, making it the fifth most common diagnosis responsible for antibiotic therapy. 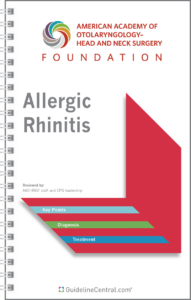 About 20 million cases of presumed acute bacterial rhinosinusitis (ABRS) occur annually in the United States, rendering it one of the most common conditions encountered by clinicians. The importance of ABRS relates not only to prevalence, but to the potential for uncommon but serious complications that include meningitis, brain abscess, orbital cellulitis and orbital abscess.